Enjoy guaranteed results when you have an experienced plumber in Laguna Niguel, CA working on your plumbing needs. Contact us if you do not know what to do with a plumbing leak in your home. Our service vehicles are equipped with all the necessary plumbing tools, plus replacement parts, so our personnel can perform the required service right there and then. Because plumbing issues can happen, whether you like it or not, the challenge is how you will deal with them at the least possible cost to you. The last thing we want to do is to go into your home and start destroying walls to get to the pipes. Our Laguna Niguel plumber will respond immediately to your call for plumbing repair or periodic maintenance. Call OC Plumbing Pros 24/7 at (949) 371-8413. Your Water Heater Is in Need of Repair? Call Us: We understand how you will feel when your water heater is in trouble. While there, we can also see if you are not overloading or overusing your heater at all. Our experts can also determine if your unit is appropriate for your daily requirements, and advise you accordingly. Having us over also allows us to check if you are using your heater to its full capacity, or beyond its capacity. Maintaining Your Drains to Avoid Bigger Repairs: People tend to overlook the condition of the downspouts and drains. Not only is this an eyesore, it is also unsanitary. But we are here to deal with things like this, using our high-tech gadgets and our expertise to safely and completely unblock the clogs from your drains. More savings for you, of course. Precise Spotting Of A Leak and Repairing It: Not all leaks, slab leaks, especially, are easy to find in your Laguna Niguel home, but our experts know a leak when they see them, even if you do not, and we repair it too. If you feel that you consumed the same amount of water, there’s a leaky pipe somewhere. We’ve had cases when homeowners came back from a vacation to find their house in wreck because of an unattended water leak. In less extreme cases, a leak can cause a sudden surge in your monthly bill. Leaks have the potential to create havoc to your property and increase your water bills by folds. Even small leaks can create big problems and losses in money. Emergency Plumber Laguna Niguel – Call Us Now! 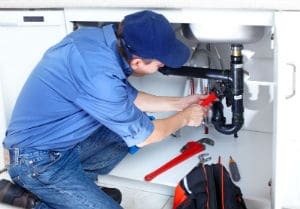 Re-piping, Plumbing Installation and Repair of Garbage Disposal: From replacing a burst water pipe in your Laguna Niguel property to rerouting pipes to accommodate building renovation projects, our experts can get the job done in accordance with safety standards. Let us emphasize that repairing or installing garbage disposal is something you must leave under the hands of an expert, because there are specialized tools and skills needed to get the job done flawlessly. Never, ever try to do this on your own. It’s a complex system of gravity, water pressure and flow. We also take care of the permits and licenses required under the building code. Whether you have a leaky pipe underneath floor boards and ceramic tiles, we have the equipment to limit the damage to the smallest area possible, which would be to your advantage since you can save on materials and labor. Toilet Installations and Repairs: Have peace of mind that our team will address your situation right away. Aside from that, a dysfunctional toilet can spell bad news for your health, too, especially if there is water leaking out of it in your home. We understand your frustration when your toilet is leaking, broken, or clogged. Just give us a service call, and immediately, our plumbers will come right over to inspect the toilet’s condition and fix it, if rendered practicable; otherwise, we will be honest in telling you to simply get a brand new toilet. 24-Hour Emergency Services Only Here at OC Plumbing Pros: That’s why we have a hotline that you can call anytime, anywhere you are in Laguna Niguel, CA. A plumbing problem can catch you off-guard, disrupting your daily routine, and sometimes, it can potentially damage your structures, as well as your health. We recommend that you call us the moment you sense that there is something wrong with the way your plumbing system works, so we can take immediate action before the problem blows out of proportion. Call Our Laguna Niguel Plumbers Now! Call our plumbing contractors today and see why we are the best choice near you. Ultimately, you are the only who will decide on which of these options is the best choice. We do this through the experience of our technicians, and the tools and equipment we’ve acquired through the years. Contact us at OC Plumbing Pros now so we can get the process going. Call us today at (949) 371-8413!